One of the most exciting gaming products this year got it’s first expansion, and with this review I want to have a look at how the gameplay changes for this faction. If you’re unfamiliar with Dungeon Command, I highly recommend you read my review, or better yet, just go and buy a copy and at the same time convince a buddy to do so as well. 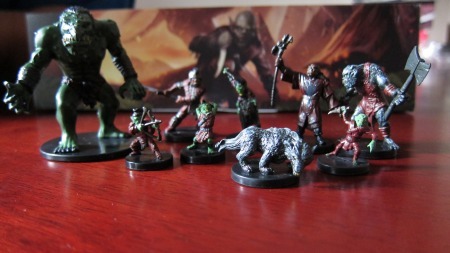 Like any miniature game, you need a partner who also owns a warband. You can play a game by just using one box, but it’s hardly fulfilling – it’s a lot more exciting when you have a box each and play the full-on battle. As with any expandable game, there are different levels of immersion. You can limit your warband (and your opponent’s warband) to a single box, but as you play the game more, you’ll want to expand your army and it’s capabilities. 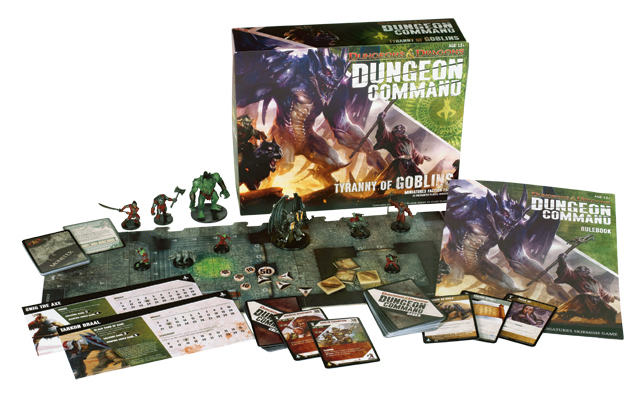 The Tyranny of Goblins faction pack is a great way to add new miniatures to your batallion and introduce some new strategies to your order deck. 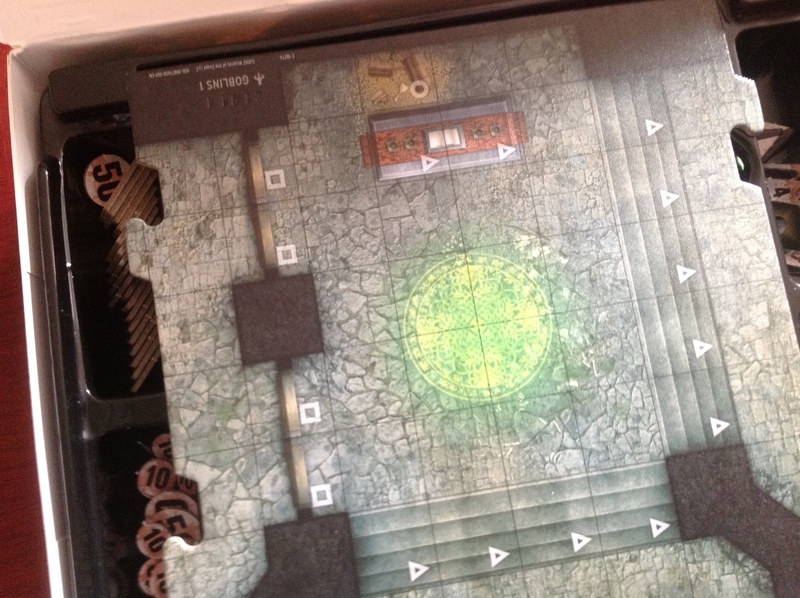 The great thing about Dungeon Command is it’s unique ability to blend elements from miniature skirmish games and collectible card games without seeming like it strays too much into the territory of one or the other. But before we get to the gameplay itself, let’s not forget that terrain is a very important part of any skirmish game, and we get four new tiles in the set with some very interesting features. The tiles have great ways to create defensive forts, whilst sneakily unleashing your reinforcements with cards like Into the Fray. The great thing about the tiles is that when you own more than one faction pack, you can mix and match them to create whatever terrain suits your warband. All these obstacles are there for a reason. Goblins are sneaky, and if you command and army of them, you have to be sneaky too. With very few hitpoints, they might seem like a pushover army at first, and hopefully that’s what your opponent is thinking when you play an order card that changes everything. He or she might be wiser next time, but there are enough tricks to keep your opponent always second-guessing themselves. For example, playing against the Cormyrians I’ve drawn in my opponent’s army close to my starting area and have left quite a few of his soldiers damaged. Because of my commander, I was able to deploy creatures at the start of my turn, and decided to introduce the bugbear into the battlefield who untaps every time a creature dies next to it. So as long as I could keep killing things on the bugbear’s activation, I could untap him and attack again. This way I took down two enemy miniatures with the bugbear, damaged a third one and finished it off with a different unit. And yes, the goblins ARE cannon fodder. After they’ve done the damage, they are very likely to die. But that’s OK, as you’ve got bigger things coming from the reserves. Your hobgoblin soldiers are only Level 3 but have a whopping 70 hitpoints and can withstand copious amounts of punishment. It takes forever to take them down, and in the meantime you can wilt away the opposition. You’ve still got the best part of your army in the reserves, that being the Troll and the Horned Devil. Your opponent will have to put everything he’s got to take one of them down, and even then it might not be enough. To be fair, in my first game I never even got to play those two as I’ve managed to strike a final blow to my adversary’s morale without having to deploy them. Having said that, if I did need to deploy them I had a potent combination of order cards in my hand to make sure they stayed alive. Mortal Wound is an instant attachment that prevents all damage but kills your unit during the deployment phase, meaning they have one more activation left in them. However, Rally removes all attachments from a friendly unit, so my big guy stays alive and wreaks havoc to puny humans. The game still features extra cards that let you use your new minis in the Adventure System boardgames, especially Wrath of Ashardalon where these critters might find a new thematic home. 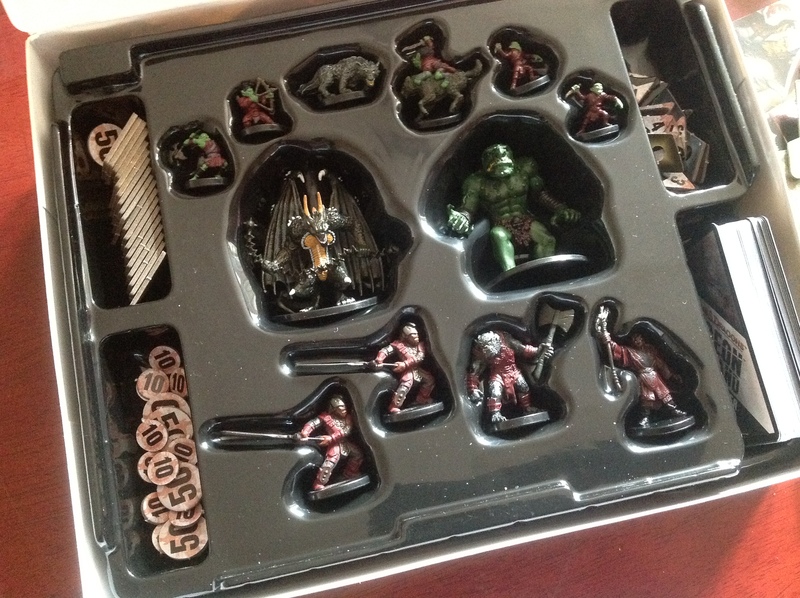 The quality of the things inside the box is the same as the previous sets. The paint-job is OK, but as with all pre-painted minis you might want to do some adjustments of your own. The Horned Devil is definitely an exception to that – I wouldn’t want to change anything about him as he looks awesome straight out of the box. The cards are still made out of the same cardstock but that is to be expected. Don’t be fooled by the aesthetics though – this game is all about the gameplay, which at the moment is unique and unrivaled. And I’ve seen singles sales surfacing on ebay which can only mean that there is demand and the game is doing well. All in all, I would recommend this faction pack to anyone who enjoys playing sneaky tricks and big brutes – it’s tremendous fun and I can’t wait to play it again. And don’t forget, the fourth faction pack – Curse of Undeath – comes out in November introducing even more variety to the game, followed by the fifth one, Blood of Gruumsh in February next year. I have an admission, and it’s not one I’m comfortable making. As far as RPGs go, I’m quite new to the whole thing. I mean, by now I’ve played tabletop roleplaying games for about 8-9 years, but any convention you go to, any public play game you attend, there’s always that one guy. That guy who goes, “oh I’ve been playing DnD since it came out in 1842, before the French Revolution bla bla bla…” You know the guy I mean. It might even be you. That’s OK though, I’ve come to accept that I’m a relative newbie, and mostly blame it on my post-soviet upbringing. What I am ashamed of though, is that while I’ve been a roleplayer for almost a decade, I’ve only been playing Dungeons and Dragons since 2009. Shock! By now, some of you might be thinking, what has this got to do with Halls of Undermountain, the new supplement/DM tool that was released today? And what’s up with that horrible movie pun title? Well, believe it or not, this is a product review, but we’re still getting to the review part. So, Undermountain. I imagine this name means many different things to many different players. Ffor me it’s the first thing that made me want to play DnD. One of the first roleplaying games I have played was that Vampire game all them trendy kids used to play. I didn’t have much say in the matter, even though I was the DM. None of us had ever played tabletop roleplaying games before, but the group consensus was that we should play Vampire, since all goth stuff was cool at the time. Don’t get me wrong, I think the World of Darkness games are brilliant, and they have a special place in my heart. But as I was weaving plots and conspiracies between elder creatures of the night, my heart was yearning to explore a world of fantasy. In my group, I was the only one. OK one more paragraph and we’ll reach the review part – I promise. This realisation, that I want to play DnD, took quite a bit of time to solidify. I’ve always been a fan of the computer games. Baldur’s Gate, Icewind Dale, etc. And the more I thought about roleplaying games the more I wanted to explore those worlds by myself. Visit my version of Fareun, or Sigil, or even the Underdark. And I remember very clearly, how one slow day at work turned into a day of exploration of DnD. It was a day when a book called Expedition to Undermountain came out, and it’s cover captivated me so much. It instantly became my office computer wallpaper. Here, I thought, is what I want – a sense of mystery, intrigue, and a journey into the unknown. I never bought that book. As I mentioned, my group never wanted to play DnD. It was too mainstream for them. As it happened though, I had a drastic alteration of life, and a new geographical location coupled with a return to university provided me with a bunch of young creative writers who all wanted to play Dungeons and Dragons. And since then, I’ve heard the name Waterdeep, and Halaster Blackcloack, and Undermountain many a time, but I knew there was so much lore behind it, I was too scared to explore it. After all, I am a DnD newbie, and I feel like there’s years of fictional history that I missed out on. So it took me two paragraphs. So sue me. I got there in the end. 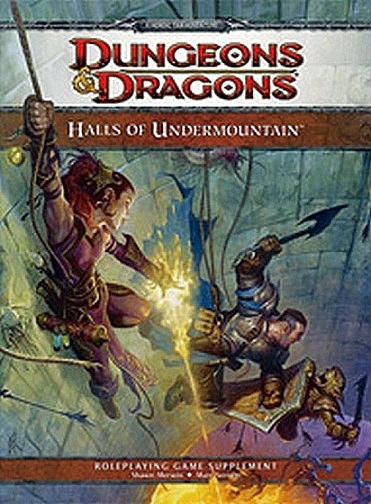 (drumroll) Here comes Halls of Undermountain, the new guide to the first level of the infamous sprawling dungeon. 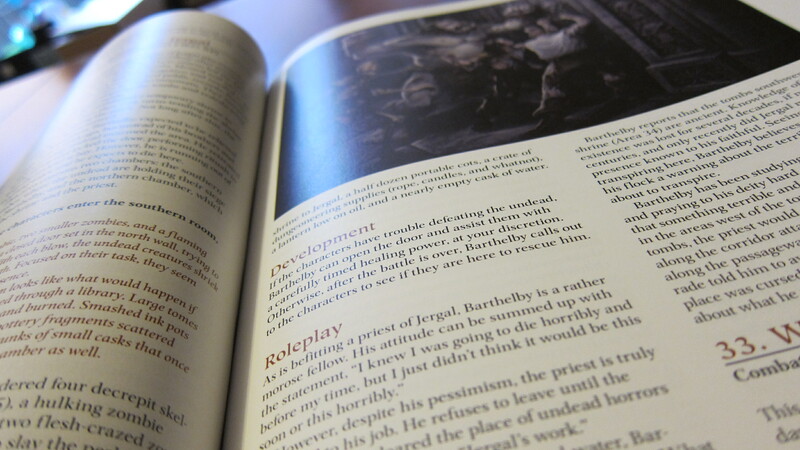 The first thing I’d like to mention about the book, is that it’s just a few pages shy of the 100 page mark, which DnD books normally tend to exceed. 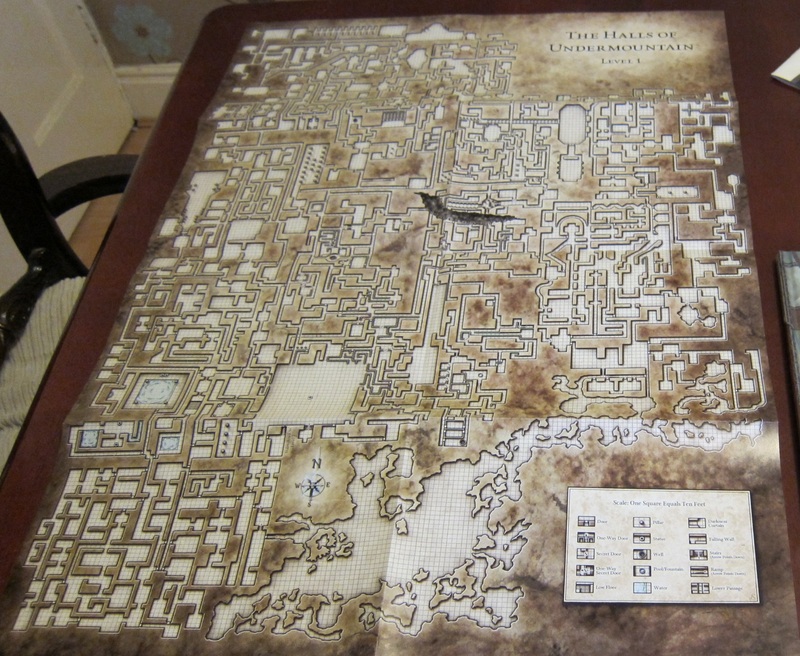 To counter-balance that, the book includes two gorgeous poster-size maps, one of which features the first level of the dungeon in it’s entirety. The contents of the book itself are mostly focused on exploring this first level. 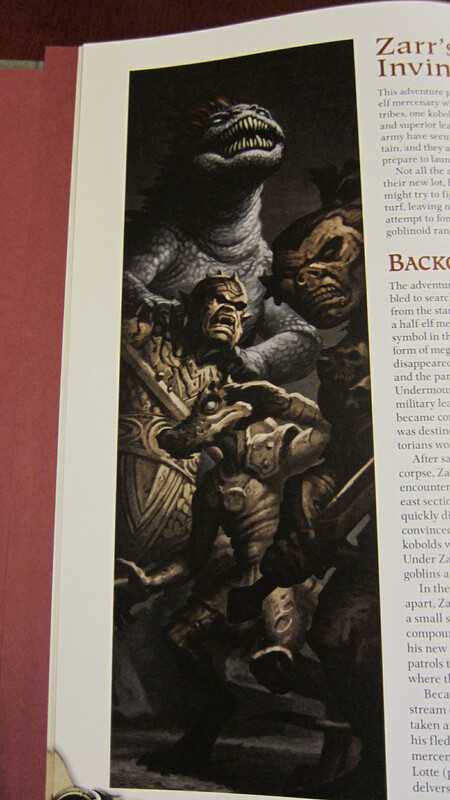 We get some history on Undermountain, a write-up on the Yawning Portal – a tavern providing immediate access to the dungeon, filled with colourful NPCs and various side-treks. We also get a suggestion for an overarching campaign that will incorporate the three adventures that form the structure of the encounter write-ups, designed for levels 1 to 5. And the rest is said encounter write-ups. Here is where things get interesting. 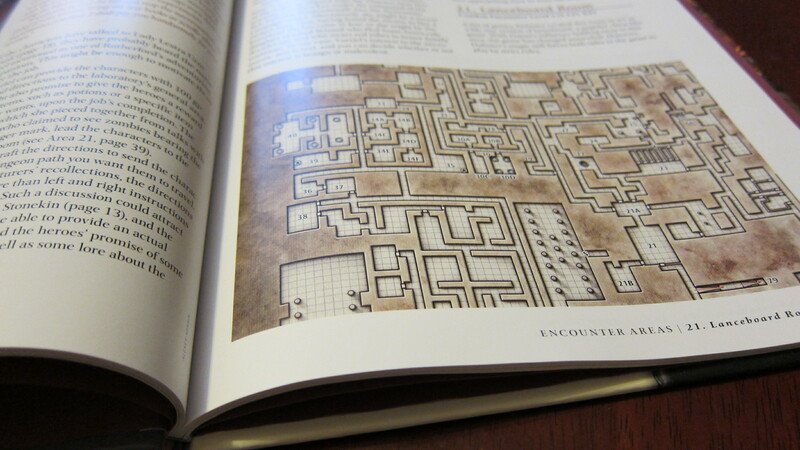 Just by looking at the big map, I’ve noticed that the room where the players are supposed to begin their dungeon trek, marked as encounter 1, directly leads to encounter 66, which itself leads to five or so other encounters, that don’t follow any numerological pattern. I was afraid that I would have to read the entire 77 encounters before I could even begin running an adventure in this monstrosity (glad to report that that’s not the case). This is also where my shame of being a newbie took over. I started worrying about not really knowing anything about Undermountain. There were so many books before this. What if I end up with a player who’s been to this dungeon so many times, he knows the first level by heart? The book deals with this in a simple yet elegant way. It tells me, that Undermountain is my dungeon. It’s whatever I want it to be. My own version. Or my player’s version. Either way, it’s supposed to be unique at every table, and it’s for us as gamers to decide what comprises it. The book goes even further than that, and encourages you to improvise a lot of it. 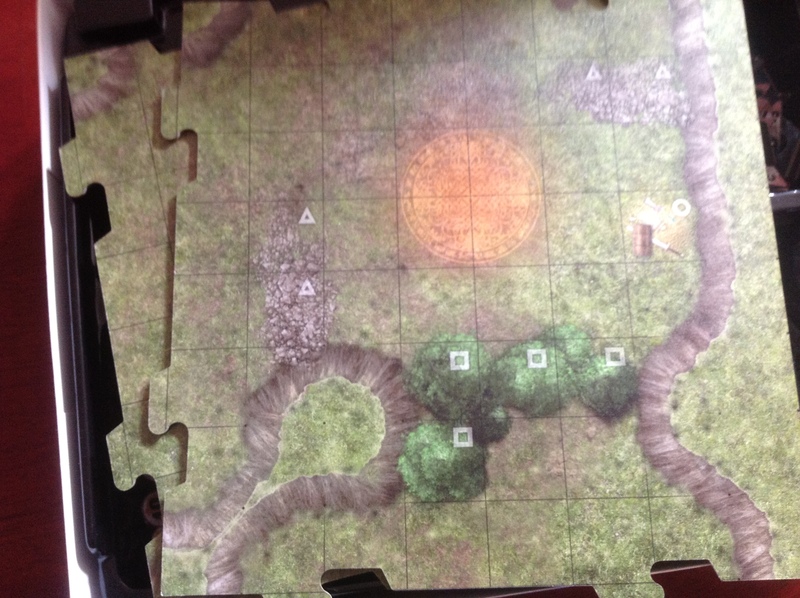 If the players step through a portal and end up in a swamp – the book won’t tell you what’s in the swamp. But it will encourage you to just make it up on the spot. It even provides room randomizing tables (which are great!). I was always dubious about improvising in DnD. Sure, I play Fiasco often, and sure, once I ran a Gamma World game that I made up there and then. But DnD is different. It feels sloppy not to prepare. A mark of a lazy DM. This book however makes it feel different. 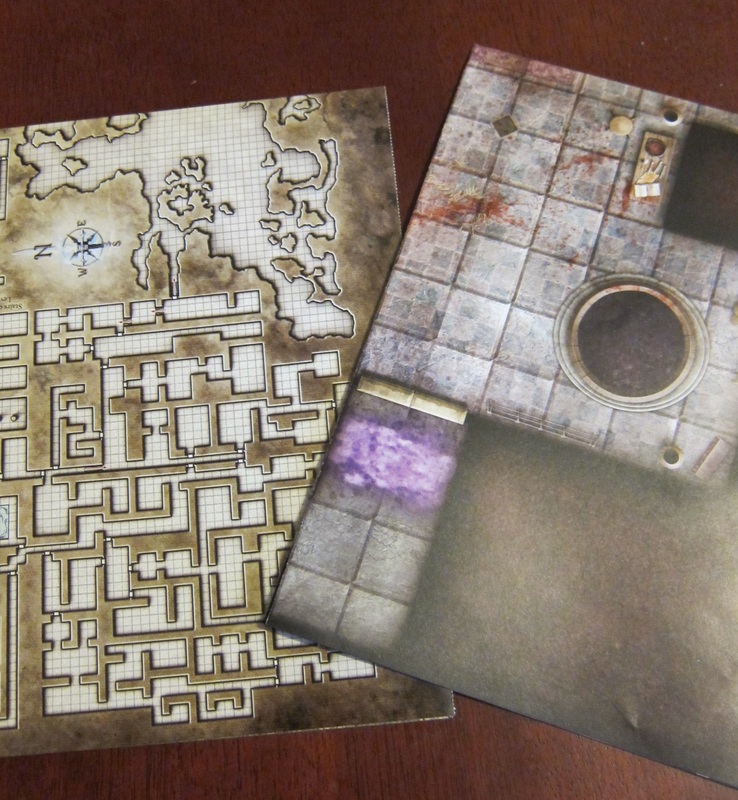 I somehow got the sense, that if I ran an Undermountain adventure – it would be OK to improvise. After all, if the book tells you so, so you can’t be blamed for being lazy. I let go, and learned to just embrace it for what it is. A few other bits I’d like to mention. I’ve really enjoyed the way the encounters were presented. Reading them feels like reading a choose your own adventure book. Most of them lack any maps or monster stats, instead referring the DM to the poster map, or to the Monster Vault respectively. I imagine this has been done to conserve space, and I think that it was the right call. There is, after all, enough material in this book to keep you going for quite a few months even if you play this campaign weekly. The map for the Yawning Portal is amazing. Everyone at my FLGS couldn’t stop gawking at it, and I can’t blame them. Just get the book and check it out for yourself.